#2,609 Sunday Dinner. – Laurel Mercantile Co.
Now reading: #2,609 Sunday Dinner. This morning we had the honor of participating in a short film that will be part of the Museum of Mississippi History later this year. 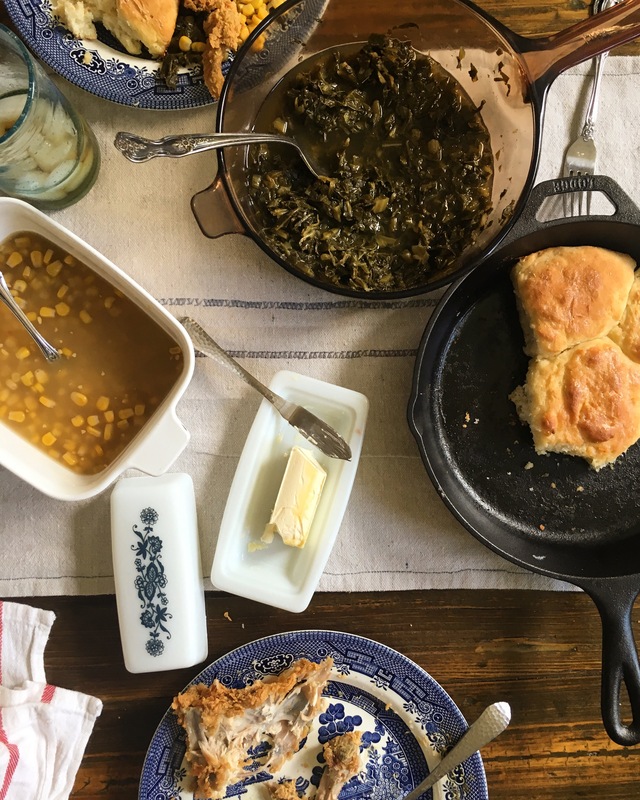 They wanted to capture a Sunday dinner, to talk about how Mississippi’s stories are important to its future, and the making of such a spread meant we weren’t able to make it to church this morning. I thought about the Sunday dinners we had growing up, always around my grandparents’ table, and I knew I wanted today to feel like that. Mammaw isn’t able to cook these days, but that didn’t mean her traditions couldn’t be part of it. I pulled her antique metal bowl out of the cupboard and followed her recipe for biscuits that she taught me in high school. She used that bowl for every buttermilk biscuit I ever had at her house. I pulled her huge non-stick Club pot from the 60s out of the pantry, boiled the potatoes and mashed them with a half a stick of butter, heavy cream, and Morton’s salt. I melted butter in her old cast iron skillet and rolled out the cathead biscuits with my hands and placed them in it in a circle with 2 in the middle, all powdery white and swimming in butter, ready to be browned and turned into fluffy, salty, crispy-on-the-bottom vehicles for more butter. We cooked the corn and the turnips and the green beans over the gas flames with salt or bacon or onion soup mix. When they were finished, I poured them each into Mammaw’s Corningware dishes and her glass Visionware pot–usually the receptacle for her famous macaroni and cheese when I was a child, waiting by the stove for the cheese and sauce to melt into the extra large elbow noodles so I could take a heaping scoop, ignoring all the other more nutritious food. I took her Blue Willow plates down from the cabinet, pulled her flatware from the drawer I only open on special occasions. I took her old tea pitcher from the butler’s pantry, and filled it with sweet tea. And even though she couldn’t cook this food, it’s just like she did. It’s like she was working alongside me in my kitchen, teaching me as I went. 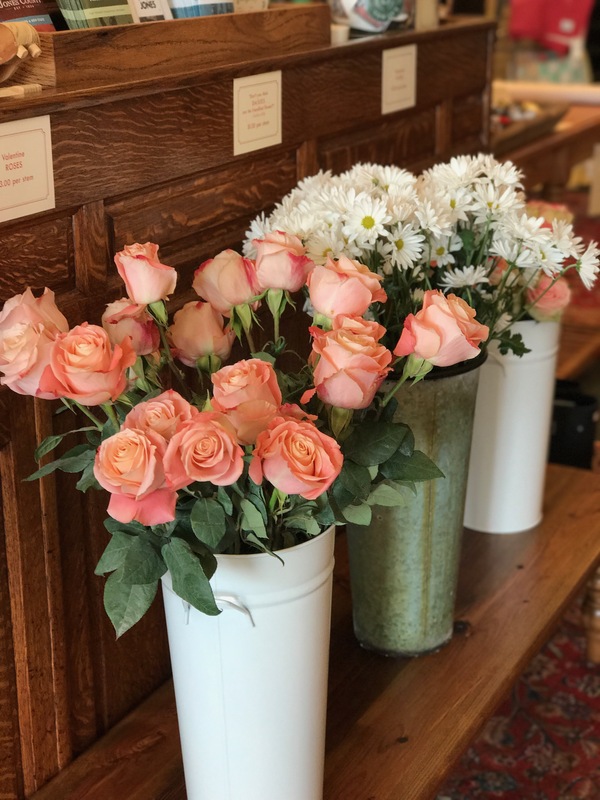 I’ve always had a fantasy of owning a little shop that would sell loose stems of fresh flowers on Valentine’s Day. A shop where 1920s French jazz plays on the record player. It’s so sweet to see it made real.